MURAL has some terms that are specific to our tool. We want to make sure everyone is on the same page before going out and creating cool stuff! 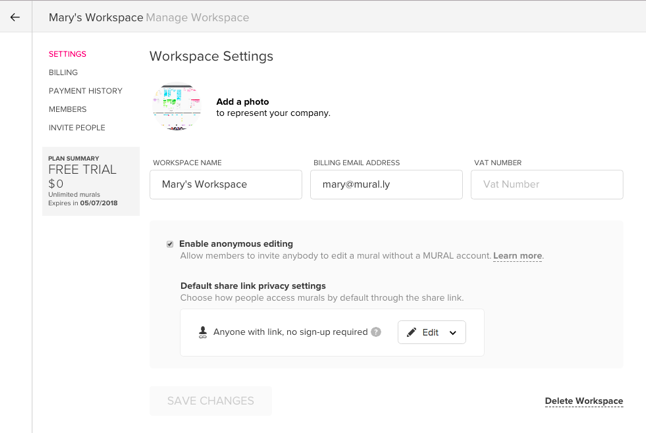 Workspace: Your workspace is where you collaborate with your organization in MURAL. Anyone in MURAL can be part of multiple workspaces. Billing is per workspace. So, if a workspace is locked due to trial expiration or lack of payment, you won't be able to access the content of that workspace. However, if you are a member of multiple workspaces, you should still be able to access the others. Mural: When written in lower-case, murals are the individual canvases upon which you add, create, and edit your content. These can be created newly from templates, or from a blank slate. MURAL: When written this way, it refers to the company, software, and brand as a whole. Permissions: This is common shorthand for who can do what inside a mural, a room, and/or a workspace. Creating Rooms: the admin of a workspace can grant another user the right to create rooms within that workspace. Publishing Templates: workspace admins can grant other workspace members the ability to publish murals as a template. These murals will appear under 'TEMPLATES' with the content of their original mural fixed in place. Anyone in your workspace can create murals from templates. View Workspace murals: rooms in a workspace may be public. Admins have the ability to disable the ability of a specific user to discover open rooms. Owner: the user that creates a room is the room owner and can manage the room settings. Create murals: each user has permission to create new murals inside a room. This permission is granted by default when a user is invited to a room. 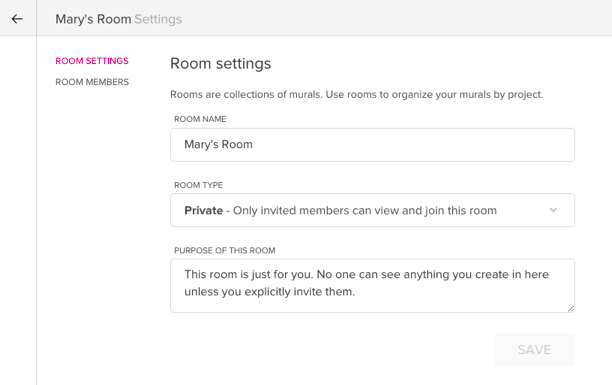 Invite people: each user has a permission to invite other people to a room. This permission is granted by default when a user is invited to a room. Duplicate rooms: workspace members must be given permission to duplicate rooms by an admin or the room owner. View-Only access: There are two different ways to give a user view-only access to a mural. First option: A user can be invited to view, but not edit, a mural by using the "Share" feature. This allows a mural owner to create a "View-only" link to a specific mural. Anyone who receives this link may view the mural, but is not able to modify it in any way. You do not need to be a MURAL registered user to view a mural using a view-only link. Second option: Users who are already part of your team can be given View only access on certain murals. You can change these settings under "Mural members", an option that can be accessed in the menu beside the mural title. 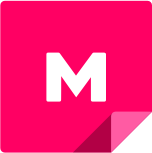 Non-members/anonymous users: Someone outside of your workspace who can collaborate via share link. These collaborators will join automatically as an 'anonymous animal' without having to sign in or create an account. Anonymous users who join with editing permissions will be able to collaborate in a mural just as though they were a member. Those who join with a view link will not be able to edit, but they will see changes in real time and be able to follow and be followed. Guests: These are like a step up from non-members, and are only available for Enterprise users. They are identified users; they’ll have a profile, and are not anonymous. They are however, limited in feature use. See more on this below. They’re also limited in time. After two weeks, guests lose access unless renewed after 2 weeks of inactivity. View-Only: This is a permission setting that allows someone to enter a mural just to view it. Someone with this permission will only be able to zoom and pan around, utilize the follow feature, view the outline, view the mural members, and chat with customer support. Members: A member is a workspace user with editing and ownership rights of multiple murals or rooms. Members typically belong to your core team as they need uninterrupted access to MURAL. Members have a profile, consume licenses and can create rooms, murals and invite others. Dashboard: The dashboard contains the list of all your rooms and murals. Via the dashboard you can also see Templates and Example murals. 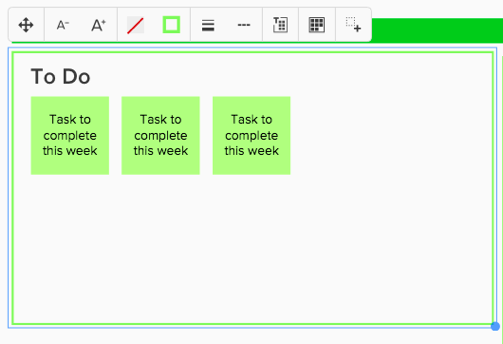 From the dashboard you can also switch to other workspaces via the upper left corner. Templates: When you’ve designed an activity you want to repeat again and again, you can publish that mural as a template. When you do this, it will act as a master copy. Thus, anyone who creates a mural from that template will begin with the exact same content. Templates are not editable, so you won’t have to worry about team members accidentally changing your important murals. 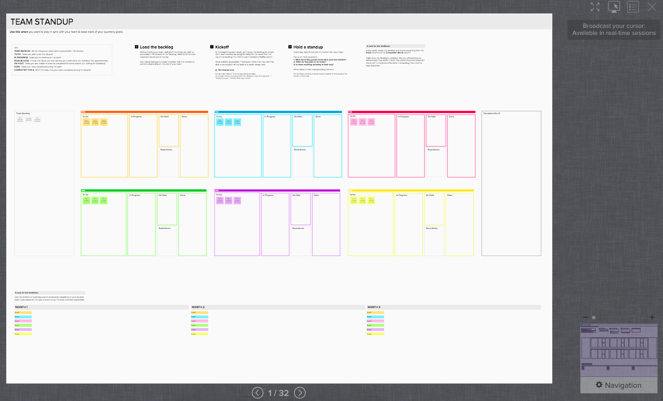 Frameworks: Frameworks are a collection of pre-formatted grids and diagrams. You can add them to any mural where you need an organizational tool or exercise. Frameworks and areas are sticky. This means that any content you add inside a framework will stick to it. If you move a framework, you will also move the content within it. Also note that frameworks add a node to your outline in the upper right. You can click on the title in the outline to zoom right to the framework from wherever you are in the mural. Connectors: These are the lines and arrows you can use to connect ideas or to create outlines in murals. The ability to “connect the dots” and find relations to come up with great ideas is one of MURAL’s main benefits. Title vs textbox: You can add titles and text boxes from the left toolbar. The font size of titles are bigger than the text boxes, but once they are added to the mural you can change their properties to fit your needs. Areas: Areas act as smart frames for your content, and allow you to navigate the mural in a unique way. A quick way to add areas around content is by using 'organize into area'. Select all the elements that you want to group, right-click, and pick 'organize into area' in the drop down. Groups: Groups are simply several elements grouped together, so they act as a single element. You can move them all together at the same time, and resize them. Mini-map: The mini-map is like a bird's-eye view of the mural where you can see an outline of your content. It lives in the bottom-right corner of every mural. It also shows you where you are in the mural. You can also use it to zoom and navigate around the mural. Activity Log: Activity Log lists all changes that happen in a mural, starting from the moment it’s created. To view your feed, you can click on the Activity icon in the top right toolbar, scroll through your feed to see who did what, and when. You can also click on an element to be taken to that spot in the mural. Outline: The outline is a list of all the different areas you’ve created in a mural. Once you create an area in a mural, it’s added to the outline. You can access the mural outline by clicking on the bulleted list icon in the top toolbar. From here, you can reorder the areas by dragging and dropping, and navigate directly to an area by clicking on the title in the outline. Presentation Mode: The presentation mode allows you to navigate around the areas just like a slideshow. Anyone who accesses a view-only link of the mural will be taken directly to the mural in presentation mode. 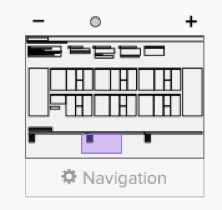 Navigation settings: These control how you zoom in/out, and pan/scroll around the mural. You can choose between mouse mode or trackpad mode. Mouse mode: When you use an external mouse to navigate. This will look the same in any browser. Trackpad mode: When you use the trackpad to navigate. This will differ depending on the browser you’re using. Account settings: You can access these by clicking on your avatar on the bottom left corner. Here, you can update your profile information, set your notification settings, integrate MURAL with other apps, update your navigation settings, and see all the workspaces you’re a part of. Workspace settings: This is where you can edit your workspace’s avatar, the name, the billing e-mail address, add a VAT number should you need to, and control non-member/anonymous editor permissions. You can also delete your workspace via this page. Note: only admins will have access to this page. Click on the workspace name in the upper lefthand corner, and select ‘Manage workspace’. Room settings: This is where you’ll set the room name, the type of room (private vs. workspace), and the purpose of the room. Only the room admin will be able to see/edit this. 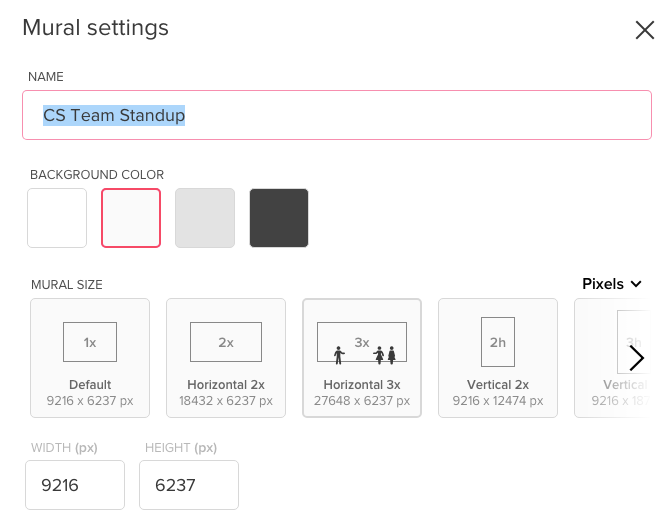 Mural settings: This is where you set the mural name, canvas color, and mural size. Now you're ready to start creating awesome content. Feel free to revisit this article anytime, and we recommend sharing it widely as a reference, especially for new folks.